Every one of the society’s publications contained a distinct view of the sinner’s road to everlasting life, so that every individual into whose hands a copy might fall would find in it a full answer to the all-important question, What must I do to be saved? These publications too were adapted to all ranks, to all capacities; to the rich as well as to the poor; to the learned as well as to the ignorant. The tracts were imported from England having been commissioned by the RTSL where it had commenced in 1799. The tracts produced by the society were not confined to English. By 1841, they had been printed in 86 different languages, by 1847, 98 languages, and by 1861 the RTSL published in 1,014 languages and dialects and the RTSL annually published the numbers of publications sold and distributed. From the time of the foundation of the RTSL in 1799 until 1873, a total of around 1,490 million publications had been circulated with a distribution of 50 million annually. The NSW RTS, although with distribution figures of a much smaller quantum, also reported its distribution figures which are tabulated in the table below. the diffusion of scriptural truth for the illumination and conversion of the world; and also because the supporters of the one were in the great majority of cases the supporters of the other, while the public advocates of both almost always consisted of the same individuals. This was not an amalgamation of the two societies, as the management and operation of each society would remain separate, but they would publish a joint annual report and hold joint annual meetings. As seen in the table below for 1849, the committees were identical. This arrangement only lasted the year with the societies resuming their previous practice of separate meetings and reports. The RTS also sought to decentralise its operations and by 1850 had established small depositories in various locations: ‘Mr Nutter, Queanbeyan; Mr Thompson, Bathurst; Mr Faux, Windsor; Rev Mr Mc Intyre, Maitland; and Mr Richardson, Redfern’. 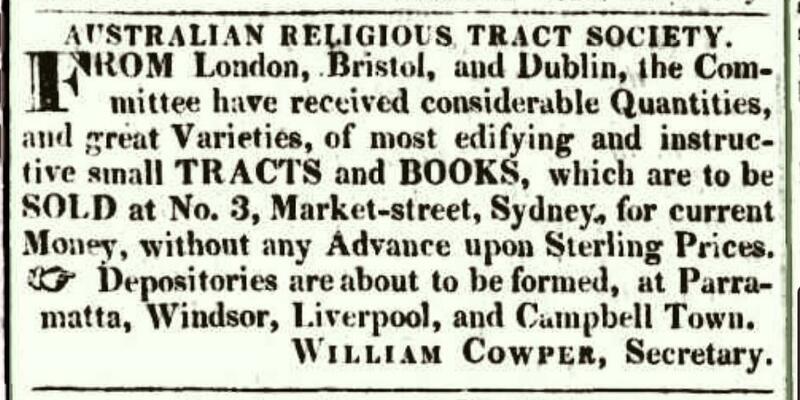 In 1851, under the vigorous secretaryship of James Comrie, the RTS had begun to advertise their Sydney depository in the newspapers which resulted in increased sales. Also, following the example of the home society, it had also begun the joint employment of a colporteur with the Bible Society. The colporteur travelled throughout the colony and their reports were read at the annual meeting outlining their travels and stories of encouragement to believers in remote places. In addition to the large number of publications sold by your society throughout the year, there have been granted during the same period 47,670 books, tracts, and handbills, in English, French, German, Dutch, Swedish, Chinese, and other foreign languages, for distribution throughout this and all the neighbouring colonies-many of the islands of the Pacific have shared in the benefits with which these silent messengers of mercy are fraught, and the seamen on board the vessels frequenting our harbour from time to time have also been extensively, and in many instances willing recipients, of the blessings which your bounty bestows. In 1854, branch depots for the sales of publications were opened at Parramatta, Maitland and Brisbane, and the society was prospering with the sales from the depositories and through colporteurs. In that year, sales had increased by 25% on the previous year but donations and subscriptions, which apart from a few years in the 1850s were quite modest, were down some 57% which indicated the business side of the society was doing well but the RTS’s support by the Christian public was somewhat muted. In 1855, the Bible Society was unable to continue the colporteur arrangement and the expenses fell entirely upon the RTS and so the number of colporteurs was reduced to two. By 1857, the shared arrangement with the Bible Society was reinstituted but the costs involved made it a marginal proposition and consideration was given to discontinuing the employment of colporteurs altogether. In 1856, the society promulgated a new constitution which gave the society the formal title of the New South Wales Religious Tract and Book Society. 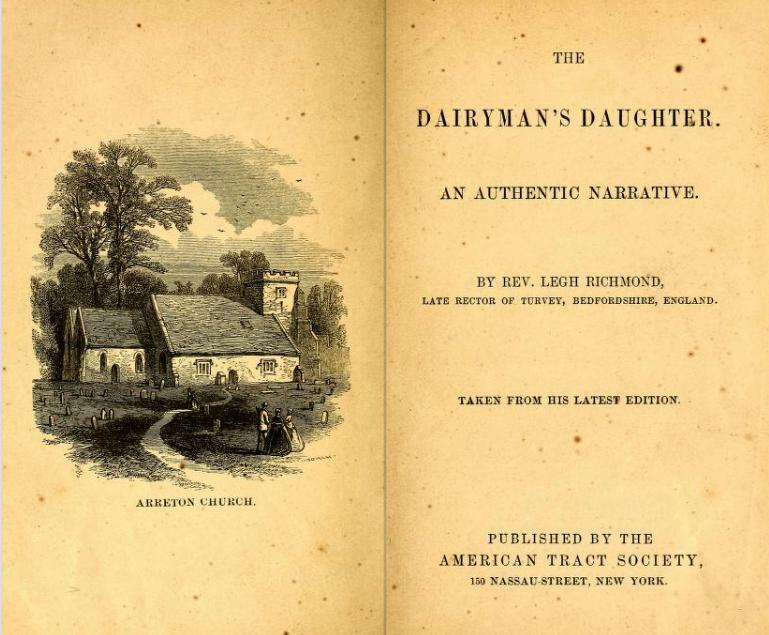 In order to stock a greater variety of publications, it was permitted to distribute, in addition to the publications of the London Tract Society, those of the American Tract Society. By 1862, the RTS further increased its range of publications by allowing the appointment of a committee to recommend publications for sale by the society. Tract Society, the Stirling Tract Establishment, Nelson and Son, Gall and Inglis, Nisbet and Co., the Christian World Office, The Book Society, and the circulation of periodicals such as the Cottager and Artisan, Band of Hope, British Workman, Child’s Companion, Children’s Friend, Sabbath-School Messenger, Old Jonathan, Gospel Trumpet, and the British Messenger. While the Society had prosecuted its aims with some success in the 1850s, by 1856 it was in debt to the London Tract Society for £2,000 and it appealed to the Protestant Churches for assistance to liquidate this debt. It is possible that only through the generosity of those such as GA Lloyd, who made himself responsible for £900 on the society’s account with the RTSL, that the RTS could continue to function. In 1857, the Secretary could report a doubling of sales which assisted in reducing some of the debt but the debt, amounting to £1,700 in 1860, was ‘paralysing its energies and circumscribing its usefulness’  and continued to be a brake on the Societies’ activities. A loan of £450 by several supporters allowed the society to provide a wider stock selection and sales were strong, but the reality was that without the ‘forbearance and liberal conduct’ of the London society, to whom most of the debt was owed, they would not have been able to survive. The RTS simply did not have the local financial support to exercise its ministry without the financial assistance of its parent body and it was, in its own words, ‘in debt, and in danger’. By 1865, the debt had been reduced to £850 which was a considerable improvement but it was still a brake on the Societies’ operations and would continue to prove difficult to reduce. Over time, the RTS was served by numerous philanthropic and Christian men in its governance. Initially, clergy were the leading members of its governance, but as the RTS matured lay Christian business men began to assume the major role in the RTS. Some members served for very long periods of time, such as George Allen, George A Lloyd and John Fairfax, who each served for more than 30 years. Below is a table of the names of those who served 10 years or more and indicates the number of years each one served. In 1861, the Bible Society opened Bible Hall in New Pitt-street and the RTS moved all their stock to this location, but scandal lay ahead. It is with deep regret that your committee refer to the loss which has been sustained by your society during the past year through the unfaithful conduct of their late agent. To discountenance vice, and to deter others from similar offences, your committee were reluctantly constrained to prosecute Mr Joseph Morrison who was convicted, and sentenced to three years’ imprisonment in Darlinghurst gaol, with hard labour. Your committee has taken such steps as to them appeared necessary to prevent similar defalcations in future, and have resolved not to employ any agent who cannot give such security as may be sufficient to protect our society from loss. 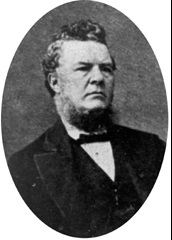 Joseph Holloway Morrison, who had been assistant Depositor for a number of years, had succeeded Samuel Goold in 1859 as Depositor. Morrison was paid £50 per annum by the Tract Society and 15% on all sales over the counter and 5% on the whole sales, the whole sales being considered to be the amount of £10 and upwards. In addition, he received £75 per annum with a 10% commission on all sales for the Bible Society. In 1862, he was convicted of embezzlement of Society funds, both those of the RTS and the Bible Society, of up to £600. During his trial, the RTS committee received some criticism for its lack of auditing of its Depositor. From the time of Morrison’s embezzlement, the Society required a substantial bond of £ 500 from any appointed depository. The Jubilee meeting of the RTS was held in 1874 and it was noted that the year had brought the ‘largest sales of any year in its previous history’. The RTS attributed this not to any action on their part but perhaps to the year being one of prosperity throughout the colony. The following year, John Mailer the depository resigned and new arrangements were entered into for the supply of RTS publications. There were no further reports of the meetings of the RTS beyond 1874. 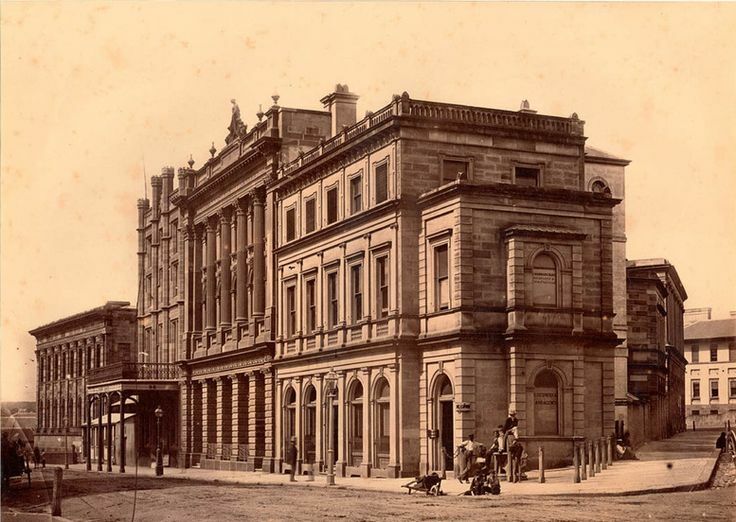 In 1876, the depository was relocated to the premises of C E Fuller’s Stationer’s Hall and sales were on a strictly cash basis from this point onwards. 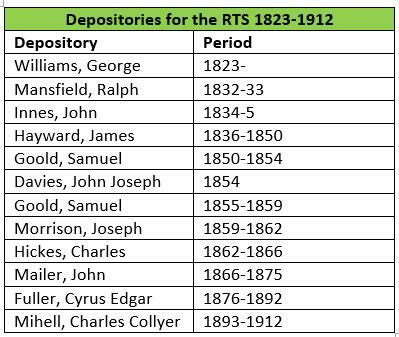 Fuller remained the agent for the RTS until 1892 after which a depository ceases to exist, or it is possible the depository relocated with the Bible Society and Charles Mihell was employed as the Depositor. The publications of the RTSL remained popular, imported directly from England and available from commercial bookshops. This availability and the difficulties of the economic depression of the 1890s were probably sufficient reason for the RTS to cease its work as a separate organisation. SMH, April 3, 1851, 3. Brisbane himself generous funded the RTS providing some £250 to purchase stock. Sydney Mail and New South Wales Advertiser (Sydney, NSW), May 30, 1874, 703. SMH, November 10, 1860, 8. Sydney Gazette and New South Wales Advertiser (Sydney, NSW), October 9, 1823, 3. SMH, April 3, 1851, 3; Cowper indicated this in 1839. The Sydney Herald (Sydney, NSW), September 30, 1839, 2. 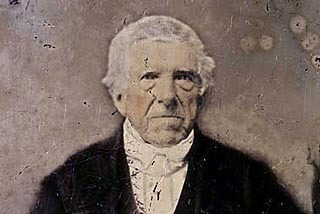 He was replaced as joint Secretary at the 1840 annual meeting. Sydney Monitor and Commercial Advertiser (Sydney, NSW), September 24, 1840, 2. Sydney Gazette and New South Wales Advertiser (Sydney, NSW), September 16, 1826, 3. The Colonist (Sydney, NSW), November 30, 1837, 3. William Jones, The Jubilee Memorial of the Religious Tract Society (London: Religious Tract Society, 1850), 530. Jones, The Jubilee Memorial of the Religious Tract Society, 531. Sydney Monitor and Commercial Advertiser (Sydney, NSW), September 24, 1840, 2. Sydney Herald (Sydney, NSW), November 26, 1841, 2. SMH, November 28, 1842, 2. Sydney Monitor and Commercial Advertiser, September 24, 1840, 2. In years like 1846 the reason that so few tracts were distributed was that the stock was exhausted and supply from the parent society had not arrived. SMH, January 22, 1847, 2. Samuel Gosnell Green, The Story of the Religious Tract Society for one hundred years (London, The Religious Tract Society: 1899), 5. SMH, January 22, 1847, 2. SMH, October 30, 1861, 8. SMH, March 14, 1849, 2. SMH, February 27, 1850, 2. SMH, March 2, 1852, 2. SMH, February 22, 1854, 2. SMH, March 1, 1853, 2. SMH, March 1, 1853, 2; Niel Gunson, ‘Threlkeld, Lancelot Edward (1788–1859)’, Australian Dictionary of Biography, National Centre of Biography, Australian National University, http://adb.anu.edu.au/biography/threlkeld-lancelot-edward-2734/text3859, published first in hardcopy 1967, accessed online 22 September 2017. SMH, February 26, 1856, 5. SMH, May 29, 1855, 5. Empire (Sydney, NSW), February 26, 1856, 4. SMH, November 11, 1857, 2. SMH, October 28, 1862, 5. Sydney Mail and New South Wales Advertiser (Sydney, NSW), May 30, 1874, 703. SMH, October 28, 1856, 5. It would appear there was also a bank debt as well. SMH, October 28, 1863, 5. SMH, October 28, 1863, 5. SMH, November 8, 1865, 5; the debt was £600 in 1867. Sydney Mail (Sydney, NSW), November 9, 1867, 7. Empire (Sydney, NSW), September 26, 1859, 1. SMH, April 30, 1862, 5. SMH, April 29, 1862, 5; May 3, 1862, 5; July 10, 1862, 2. SMH, April 8, 1862, 1. The reasons for Hickes’ dismissal, who held the position from 1862-1866, were not given. See Sands Directory 1866, 410. Sydney Mail (Sydney, NSW), November 9, 1867, 7; Sydney Mail and New South Wales Advertiser (Sydney, NSW), May 30, 1874, 703; Australian Town and Country Journal (Sydney, NSW), December 26, 1874, 35. In 1846 he joined the Audit Office, was appointed chief clerk in Jan. 1856, and Auditor-General of New South Wales in July 1883. SMH, December 4, 1868, 7. The date of the commencement of Hayward is uncertain. See the speech by G A Lloyd. SMH, May 27, 1874, 3. SMH, October 5, 1876, 2. Charles C Mihell was ‘Depository’ or Agent for the Bible Society for this period and it maybe that he had the same role for the RTS as all others before him had done. This is speculative as not evidence exists to confirm this possibility. 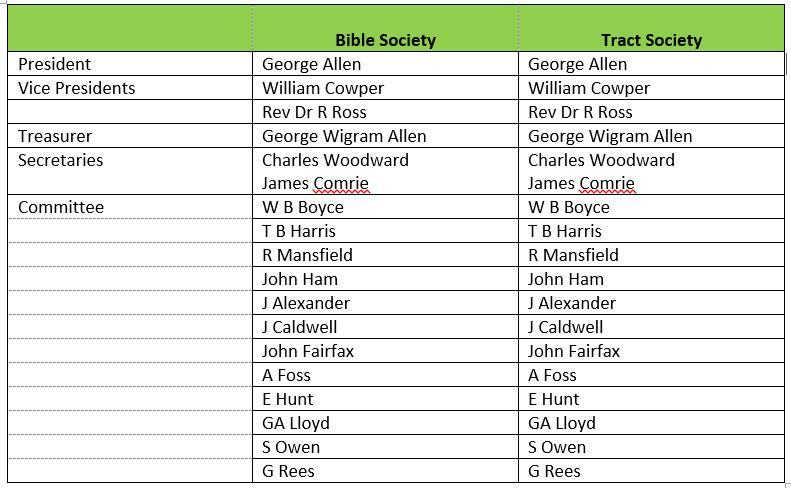 Mihell was ‘Depository’ for the Bible Society for this period and it maybe that he had the same role for the RTS as all others before him had done. This is speculative as no evidence has been uncovered to confirm this possibility. SMH, July 1, 1893, 16; August 24, 1912, 13.The Sydney Mail and New South Wales Advertiser (Sydney, NSW), October 15, 1892, 863. The Bible Society, however, changed it rules and no longer retained the position of depository. SMH, May 3, 1892, 5. By phinaucohi in Philanthropy on October 17, 2017 .